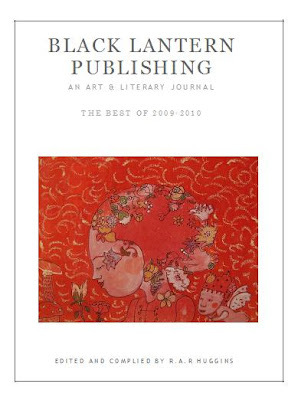 Black Lantern Publishing is proud to announce our printed, Best of 2009-2010 collection, which will be available for purchase in the Fall of 2010. Included in the publication is Issue I (Fall 2009) in its entirety, along with selections of the "best of" our published writers and artists of Spring 2010 and our yet to be released, Summer 2010 journal. Originally, Black Lantern had anticipated releasing a print version of each of our online issues. Yet as we continue to grow and with our increased reader base, we feel that our online forum has been a great success, and do not wish to see that change. However, we would like to offer our readers the opportunity to own a printed journal with selections of our published works. Presently, Black Lantern is planning on releasing a yearly print version of the online journal for purchase, which will be available on our website. Included in the printed journal will be a compilation of art and literature from the Winter (Dec.-Feb), Spring (March-May), Summer (June-August), and Fall (Sept.-Nov.) issues of our online journal, selected by our editor-in-chief. This first, printed copy, will include our very first issue, along with selected works from our Spring and Summer issue (as a Winter issue was not available for this year). As always we would like to thank our readers for their continued support, with hopes that our print version will be as great a success as our online journal. For questions or queries, feel free to contact us at blacklanternpublishing@gmail.com. Black Lantern Publishing is the property of Rebecca Huggins © 2009. All rights reserved.